Smart phones are one of the biggest influences in everyday life. Being able to be a touch away from your customers means everything. Our mobile marketing campaigns can take your company to the next level. DigDev Direct’s Mobile Marketing Services will provide a vertical lift in your direct marketing campaign results by targeting the industry’s most responsive permission based wireless database. Clients are able to reach 82MM mobile subscribers and target by nearly 300 various segmentations, including age, gender, ethnicity, wireless service provider, handset type, marital status, presence of children, donors, tech savvy users and much more. By including mobile marketing with other traditional methods of advertising we help marketers build brand recognition, and promote new products and services. Our goal is to help clients achieve targeted, effective results and succeed in today’s competitive market place. Reach Customers on the Go – marketers have a unique opportunity to harness the power of this interactive and personal medium. With over 80% of Americans carrying mobile phones, DigDev Direct’s Mobile Marketing capabilities allow you to reach your target audience with speed and relevance, which is perfect for advertisers that have an urgent message or a narrow window in which to generate a call to action or response. 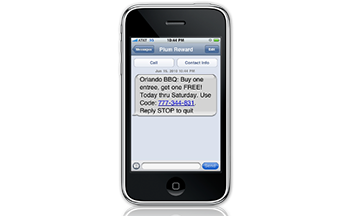 A mobile PUSH campaign allows clients to leverage DigDev Direct’s database and send a SMS (short message service) text message to our permission based mobile subscribers. Messages are sent using Short Message Peer to Peer Protocol (SMPP) for increased speed and deliverability and can be up to 135 characters, including spaces. The call to action of this message can be to drive traffic to a web site, drive foot traffic to a “brick-n-mortar” store to redeem a coupon, prompt the consumer to dial into a call center with one “click to call.” The best call-to-action involves an incentive or promise of relevant & timely information.